Stop if you’ve this one before: A preacher, a backup singer, a salesman and a foul-mouthed girl walk into a deserted hotel lobby in 1969. In a comedy, this would be the set-up of an elaborate joke. 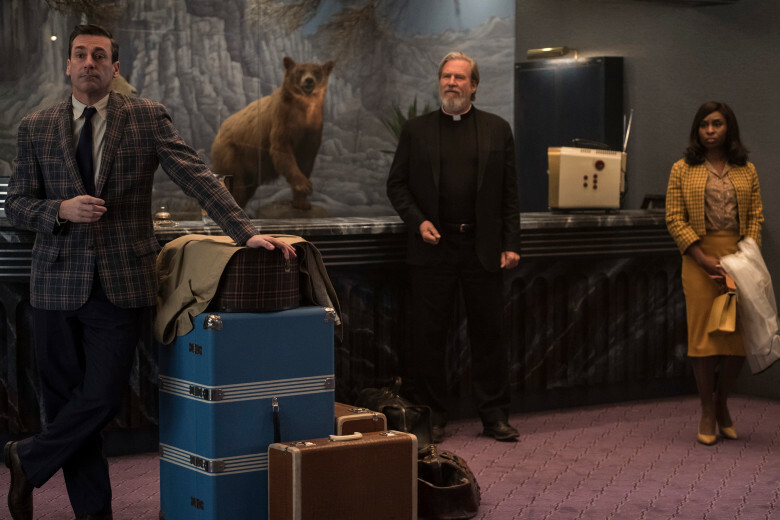 Bad Times at the El Royale takes the premise and unspools an unsatisfying noir thriller punctuated by extended violence and bloodshed. Early check-in is not necessary. The twists are aplenty so I’ll stick to the basics. Father Flynn (Jeff Bridges) is an old, rather haggard-looking man of the cloth. Darlene Sweet (standout Cynthia Errivo) is a backup singer with pipes of gold. Laramie Sullivan (Jon Hamm) is a smooth-talking, Southern traveling businessman. Emily (Dakota Johnson) struts in after smoking a cigarette in her car. They all want a room at this onetime glitzy hotel known as the El Royale. Miles (Lewis Pullman), the boyish bellman, is the only staffer around and takes his own sweet time assisting them. None of these people are who they appear to be, however. And on a dark and stormy night, secrets emerge. Despite that impressive cast, the real star is the El Royale itself. This is an art-deco beauty sitting exactly between two states, California and Nevada. To the west is warmth and ocean; to the east is exciting opportunity. Upholstered in wood and vinyl, its spacious lobby features a wet bar and a neon-colored jukebox chock full of Motown, funk and rock. Like its guests, the El Royale can’t be trusted. Miles can spy on guests in their rooms thanks to two-way mirrors and speakers. It’s as if the hotel guests are animals unknowingly on display in a perverted zoo. Cool as this set piece may be, it doesn’t do much aside from offer, well, a cool set piece. I waited in vain for the state line novelty to result in a narrative boom. Hidden hallways literally lead nowhere. And the only time a trick mirror justifies its existence is when the Tony-winning Errivo — also killer in the upcoming Widows — belts out R&B classics in her room such as “This Old Heart of Mine” and “You Can’t Hurry Love.” (What a voice!) Is the El Royale supposed to be the destination of doom? Sure seems that way based on that unnamed character in the prologue. However, this tantalizing scene is another red herring. Don’t be deceived by the duality of each character. They’re all quite one-dimensional and unappealing, with the exception of Darlene. 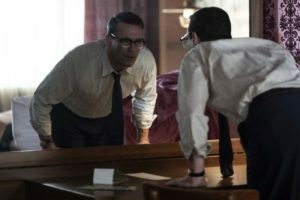 The fine actors have all done better work: Bridges has played a variation of this same grizzled geezer for too many years; Hamm and Johnson both fumble their accents. The story is not particularly nifty either — it’s just overloaded with convoluted bells and whistles. Think tangents and chapters and flashbacks and multiple scenes told from multiple points of view. Why, hello there, Chris Hemsworth as a Charles Manson-like cult figure. And special hello to Chris Hemsworth’s abs! It does appear Hamm has discovered the two-way mirror (Fox). Bad Times at the El Royaleis the work of writer-director Drew Goddard, who got an Oscar nomination for scripting the eminently watchable The Martian. He also wrote some of my favorite episodes of Lost and delivered the excellent meta horror flick The Cabin in the Woods. (You saw that, right?) He has a gift for originality and off-kilter surprises. Whatever he’s trying to say over the course of a whopping 140 minutes, it gets lost in the swirl of overambitious narrative devices. I’d venture that he’s trying to make a comment about redemption, except so few characters are redeemable. Bad Night at the El Royale is clearly aiming for a funky, hyper-violent, multi-layered Pulp Fiction vibe. That let’s-rock-n-roll title seals it. The disappointing reality: this is really one of those Quentin Tarantino rip-offs that arrived with alarming regularity throughout the ‘90s and the early ’00s. It’s missing a soul . . . and an adrenaline shot to the heart. Ah, I love spotting a typo in literally the first sentence of your review, forfeiting your credibility as a reviewer and making all your subsequent opinions and observations on the film less than worthless. If you don’t even care enough to proofread the first couple words of your own take on the film, how am I supposed to trust your judgement on anything?